This game had all the potential to be a classic local derby: Buxton, strong at home and known for a powerful pack, Bakewell, bottom of the table but capable of beating anyone on their day and fielding a changed but classy back line. Add to that a Sunnyfields pitch in better condition than anyone could remember, and a swirling wind, and the stage was set for a gripping encounter. It didn’t disappoint, and the early minutes saw Buxton, possibly just a smidgen overconfident, throwing everything into trying to batter through the Mannerian midfield. 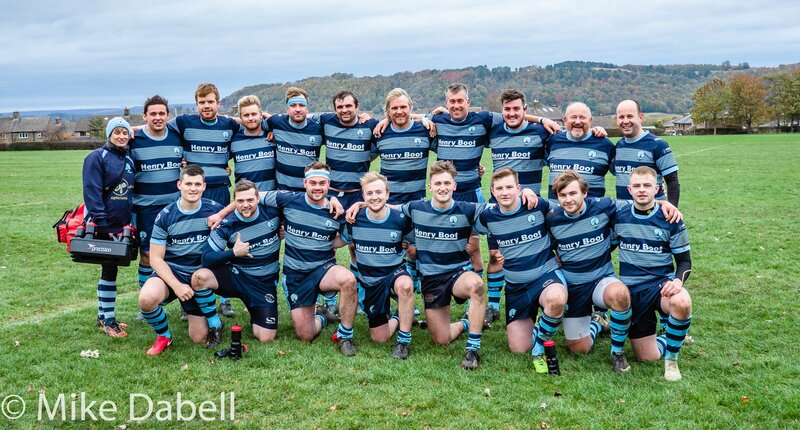 They were thwarted at every term by terrier-like tackling, led by skipper John Everitt, aided and abetted by Andrew Gregory-Campeau, Ben Clarke, Will Brocklehurst and the burly Chris Taylor in the forwards, with Will Moroney marshalling a cast-iron back line. Finding no way through, the home side began to make errors upon which Mannerians pounced. Ben Finney and Tom Hutchinson made for a lively centre pairing, always pressing and making searing breaks, and they found plenty of support in the shape of Jimmy O’Neill and the mazy running Ollie Crampton. The home side opened the scoring with a well-struck penalty, and seemed to think that would break Mannerian resolve. It didn’t, and within seconds, despite the loss of Finney to a head injury, the visitors carved up the opposition. Everitt scampered up the field before finding the impish Seb Cooke who launched a classic backs move. Moroney moved play wide, Hutchinson added pace, Joe Pearce swept round from the left wing to the right to work the archetypal two-on-one – and while Pearce could have scored, he drew his man and put Dan Barratt in for a try in the corner. Undeterred, Buxton stuck to their game plan of forward drives through their athletic, powerful pack. Mannerians took a more imaginative approach, with Moroney playing an astute kicking game, pinning Buxton back and then using relentless pressure to force errors. But it was very evenly balanced, and Buxton responded with a try after a rare loose Bakewell pass to take the lead on the 20-minute mark. Not wanting the ageless Paul Boon to remain the oldest on the park as he celebrated his 45th birthday with an accomplished display, Coach Ben Wade sent on Martin Pearce to increase the average age and weight and with strict instructions to be kind to the referee. There were signs that the home pack was becoming tired and frustrated, and soon Mannerians were scything up the field again. A series of dynamic driving mauls from lineouts saw Buxton only just hold out at half time, with Mannerians in the ascendency. Barratt nearly added a second try as he was tackled crossing the line; the referee thinking long and hard about whether the ball was grounded, then deciding it probably hadn’t been as Barratt attempted to touch it down again. The resulting scrum saw Mannerians pile on the pressure, Buxton scramble the ball clear – but only as far as Barratt, who ploughed over to score. Moroney added the conversion. The home side struck back with a converted try of their own, and then the Bakewell pack returned to the offensive. A pinpoint lineout throw by Taylor led to yet another driving maul and Buxton had no answer. The pace and precsion with which Mannerians controlled the drive was irresistible and it was skipper Everitt who came up clutching the ball. Again Moroney converted, as the visitors crept into a two point lead with ten minutes to go. Coach Wade called for the Spirit of Rolls-Royce – the famous day before Christmas when the Mannerian defence was simply impregnable in the Derby fog. And tackle after tackle went in. Replacement Joe Harker put his body on the line time and again, as on the touchline his father, Steve, was itching to join the fray and even momentarily took off his replacement’s quilted dressing gown. George Smith capped a splendid personal display in attack with a ferocious display in defence – and the pack was immovable. Unlike at Rolls-Royce, though, Mannerians were defending further and further up the park, and eventually forced Buxton into errors. The ball broke loose, Cooke and Moroney combined, Smith arrived at pace and again Joe Pearce and Barratt worked a two-on-one. Pearce popped the ball out beautifully, got clattered for his trouble dislodging a few teeth in the process, and Barratt scorched in under the posts for his hat-trick try. Moroney’s conversion was the final nail for Buxton, and they were chasing the game in the dying minutes. It was a chase they were destined to lose – and a well-deserved victory for Bakewell Mannerians that lifts them out of the relegation zone.